Contrary to the cries of the Venezuelan government and its hypocritical Opposition, Venezuela remains, as before, a state-capitalist economy based on the extraction of oil rents. The Chavista government, which calls itself “socialist”, has fed on the surplus-value generated by the working class in Venezuela for nearly two decades. This same period has seen the formation of a new capitalist class fraction originating in the state sector of the economy. Meanwhile, the working class has been left utterly destitute and malnourished as a consequence of the collapse of the country's economy. Although a few crumbs were given to the "little people" to ensure their electoral support, oil revenue enriched the "state nomenklatura" of senior army officers, bankers, sovereign funds directors, as well as ministers of the economy and exchequer, and speculators of all kinds linked to the regime. Between 2003 and 2013, well over $180 billion flew out of Venezuela to take refuge in speculation "made in the USA". While workers rummage through empty supermarkets simply to find basic provisions – increasingly forced to rely on the informal economy to obtain their livelihoods, since their own wages hardly suffice to cover even a small fraction of their living expenses – the new “Bolibourgeoisie”, as some have taken to calling it, is living luxuriously in Miami and the old capitalist class is largely unaffected by the crisis, disposing of sufficient resources and means to stave off hunger and ruin. Such is the reality within this so-called “workers’ paradise”, where the ruling class brings the full might of the state to bear on the workers in order to violently suppress strikes and hunger riots. In short, it is workers who have borne the brunt of the economic crisis. The deterioration of their living conditions has been so extreme that they have taken to the streets to protest, engaged in skirmishes with riot police, looted stores, and even organized strikes, albeit on a small scale. Of course, this isn’t to say that the working class in Venezuela is fighting on its own terrain for the seizure of power. On the contrary, it is currently being pulled between two equally reactionary capitalist camps and allowing itself to be mobilized in the defense of alien interests. These spontaneous outbursts, which often result in violent clashes between workers and the repressive organs of the state, are reactive in the main and aimed at securing a basic subsistence. In other words, they are not, as the Chavista state and capital’s “left-wing” apparatus, who’ve lined up in support of the regime, would have us believe, motivated by “reactionary ideas” or blind devotion to the Opposition. They are rather stimulated by the degradation of the living conditions of the working class in Venezuela, particularly within the past five years. 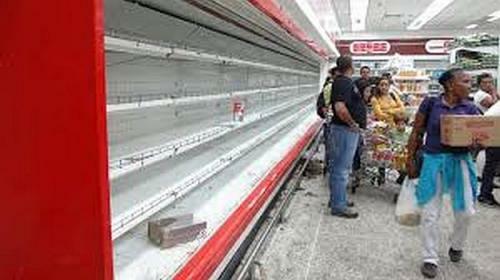 Likewise, the sizeable segment of the working class loyal to the Chavista government that exploits and brutalizes them, at least on the surface, remains so only because this government has resorted to what amounts to blackmail in order to retain their support, denying food rations to all those who appear disloyal. In other words, they are acting out of self-preservation and not a commitment to so-called “21st century socialism”. This is a textbook example of clientelism, a practice whereby people exchange political support for resources and access to employment. The crucial difference between the Chavistas and other Latin American governments is that it never occurred to the latter to call this “socialism”. It is clear that neither the government or its Opposition have a solution to the current crisis, whose roots are to be found in the contraction of oil profits, which financed the largesse of the state in previous years. The only “solution” to the crisis, if it can be called that, which both major capitalist camps agree upon is that it is necessary to squeeze the working class, so to speak. In short, to eviscerate all of the major social provisions, which function as an extension to the wage packet; to reduce wages below the point of subsistence; and crack down on any attempt by workers to organize as a class in order press their demands collectively. In spite of all the hurdles placed ahead of them by the state and capital, all of the difficulties, and the basic fact that workers do not yet possess an awareness of their position within the capitalist system, much less understand the world-historic implications of their struggle, it is necessary to continue to advance without compromise the political autonomy of our class, without which it cannot ever hope to emancipate itself. To this end, we support neither the government or the Opposition-led protests. Instead, we call on workers to form their own class political organization to act as a rallying point for others, to rebel and struggle against all capitalist factions, putting forward their own interests as a class against those of their exploiters. Down with the Chavista Government and the state-capitalist bourgeoisie! Down with all of the Opposition parties and their lackeys! Fight for communism against capitalist barbarism! Between 2003 and 2013, well over $180 billion flew out of Venezuela to take refuge in speculation "made in the USA".